Think about the pastor in your life who’s had the most profound effect on you. My hunch is that the person who popped into your brain influenced you not through their accomplishments, but rather, their presence. Pastors who can exhibit presence, despite all the things going on with them or the church, have a profound influence on people. In my case as an executive pastor, many people don’t see my role as one where the competency or gift of pastoral presence is greatly needed. But, I’ve learned otherwise. And despite knowing that, I still often choose pastoral production over pastoral presence. If you’re consistently choosing pastoral production over pastoral presence — you’ll complete stuff, just maybe not the stuff that matters. How Much "Ministry" Should Be Shared With Family? This is part two of “keeping your kids and your call to ministry.” Read part one here. As a minister, how much “work” should you discuss with your spouse? Are you a concealer, revealer, or spiller? Which one is the right way to be? I grew up in a pastor’s home. During my 17 years of marriage, I’ve worked in a ministry job. I’ve been mentored by and close to other ministers who were also married. So both through purposed conversation and anecdotally, I’ve seen a wide variety of ways to handle work discussions with a spouse. As a result, I’ve come to my own conclusions about how to approach this. My method isn’t always perfect, but I’ve created a “church-work discussion” philosophy. Concealer: This minister believes little to no work should be discussed with family. They may believe this because they value turning work off at home, or because they want to protect their family from the uglier parts of ministry. They also might want their family to develop a church philosophy from their own personal experiences, instead of from the experiences of their minister parent or spouse. Revealer: This minister discusses their ministry work at home, but sparingly. They too want their family to have their own church experiences and not be unduly influenced by what happens at the office. They do reveal, but it’s typically general rather than specific, and is driven by a desire for them to process information in a safe place. These conversations leave out names or details that could influence the listener’s opinions about a person or circumstance at the church. Spiller: This minister doesn’t separate ministry work and home. Whether good or bad, they share their experiences at work, and trust the listener to partner with them in discerning and praying through matters. They feel their call to ministry extends to their spouse, and the spouse can walk alongside them in their work. When pressed, it allows me to vent to my wife. Not specifics, but enough to get something off my chest and allow her to pray with me about it. I encourage all ministers to have a “venting” person. Typically, this person will not be a part of your church. Another minister, a counselor, or extended family member is ideal. Someone you can trust and receive counsel from, as needed. I share enough to keep my family in the know about things deeply affecting me. My family’s participation at church is unaffected. It allows my kids to have a healthy and positive view of church. Over time, my kids will discover the church and its people can be challenging. For the most part, I want this to be a result of their self-discovery, rather than a result of me announcing at dinner I’ve had a rough day because of “people.” Learning the church vicariously through me may not be best for them. Bottom line for me: I, Brian, was called to vocational ministry. Not my family. While they share in it, I don’t want to routinely transpose my work on them. I believe a spouse can effectively support their minister spouse without knowing the ins and outs of ministry work. Whatever amount of church-talk you bring home, have a plan. Know why you are sharing what you are sharing. Will it benefit your family to know something? Will it burden them? Discuss your plan with your family. Pray about it, and allow your choice to be an encouragement to you – and them. Small Churches make up 80% – 90% of the known churches in the world, but are the subject of probably less than 1% of the books and blogs about how to do church ministry. Small Churches are no better and no worse than churches of any other size. But they have been the most neglected, especially when it comes to pastoral training. New Small Church wants to help fill that gap. We exist to encourage, connect and equip innovative Small church leaders. About 200 people attend the church I pastor on a typical Sunday. It used to be 400. It’s a better church now than it was then. I know, pastors aren’t supposed to say things like that. We’re not even supposed to admit that things like that are possible. I’ve been pastoring my church for 22 years. When I arrived, there were about 35 people attending. They were very discouraged after going through five pastors in ten years and drifting from their high attendance of about 250 during that decade. They had debated closing the church entirely. In my first decade of pastoring the church, we grew to a healthy 200 people or so. Giddy with my modest success, I decided to kick things into high gear. I was going to implement all the church growth strategies I’d been reading about and break through the 200 barrier. It worked. Within two years, we had doubled to about 400 people. But we became an unhealthy church in the process. Before the push, I’d been working with people and within my gifting as a pastor. During the push, my attention shifted. People became numbers. Attendance mattered more than relationships. I became empty. And the church became unhealthy. Almost none of the growth was from conversions. It was virtually all transfer growth. We weren’t discipling new believers, we were entertaining bored Christians. Then the church started to shrink. Fast. I don’t know how small it got down to. Because I stopped counting. But it was probably somewhere in the low 100s. Not only had we lost those we’d gained, we lost a lot of the original folks, too. There are a lot of reasons why the church collapsed and nearly folded. But the main one was this. The pursuit of numbers made us sick. And sick things start to die. I’m grateful that our sickness was evident in our shrinking numbers. It forced us to deal with the problems. Some churches start dying internally, but keep getting bigger externally, so they don’t see their sickness. No, not all of them. Not even most of them. But some of them. Including mine. Through that process, I learned several painful lessons. I’m grateful for every one of them. Eventually, we corrected the downward slide. We put God’s Word and God’s people first again. Today, we’re as healthy as any church of any size anywhere. We’re loving, outward-reaching and discipleship-oriented. We’ve grown to 200. We may get bigger than that. We may not. Either way, we’ll stay healthy and keep growing, learning, discipling and sending. Yes, a church can be better at 200 than at 400. Because, bigger isn’t better. Smaller isn’t better. Only better is better. Read more about Karl and check his out book, The Grasshopper Myth. I live in the Nashville area and enjoy serving and loving my family and serving in ministry. I’ve spent my adult life on staff in the local church and the last 10 years as an executive pastor. My goal for this blog is to provide you with practical takeaways for everyday church leadership. Sign Up To Get a Free Resource! As a supervisor, you want to make sure that new employees get the most out of their first 100 days on the job. 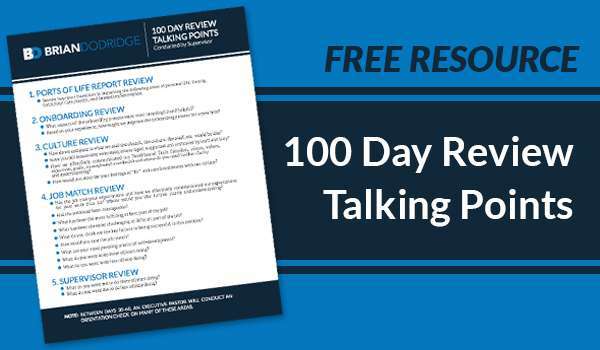 Sign up for my email newsletter to receive my 100 Day Review Talking Points free. © 2019 Copyright Brian Dodridge.